The Arum Lily Oval Table Lamp by Jenny Worrall is a hand made glass table lamp, decorated by the traditional Potichomania method with Arum Lilies on a distressed gold background. Supplied by Luxury Lighting, the Jenny Worrall Arum Lily Oval Table Lamp is a unique, hand crafted table lamp. The Arum Lily Oval Table Lamp From Jenny Worrall Is A Beautiful Handblown Glass Table Lamp, Decorated In The Traditional Potichomania Method. 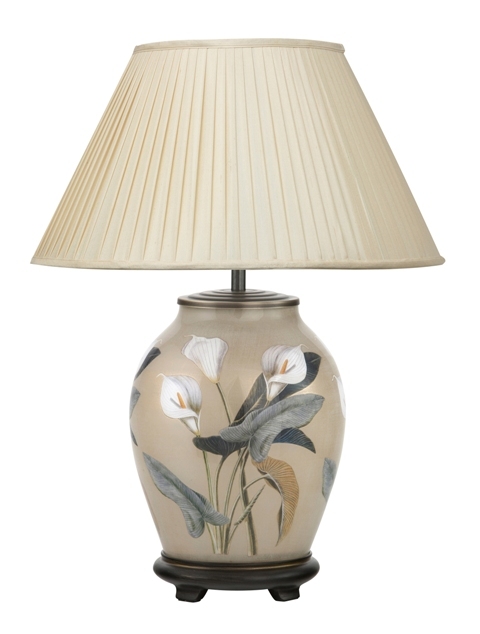 The Lamp Features Lifelike Arum Lilies On A Distressed Gold Background. The Jenny Worrall Arum Lily Table Lamp Sits Upon A Black Gold Resin Plinth And Is Supplied With A 16" Almond Knife Pleat Silk Shade. Please Note The Design Of Each Jenny Worrall Table Lamp May Differ Slightly Due To The Lamp Being Hand Made.